Not all broken pysanky are lost to posterity. 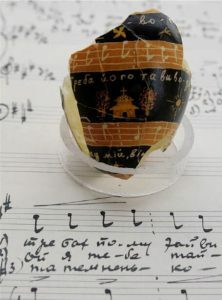 An unusual pysanka written by Tetiana Koshetz (1892-1966) has been preserved by fusing its retrievable fragments with beeswax to reconstruct her creation. This pysanka incorporates traditional motifs, such as the sun, the church and the bezkonechnyk, literally a line without a beginning or end representing the flow of eternity. It also introduces an atypical element into the design. Tetiana used the five horizontal lines employed in music notation (called a stave) as parallel bezkonechnyky (lines without end) wrapping them around the egg. She filled the lines with musical notes and placed lyrics below the music, as if the egg were a special type of organic sheet of music. Curators and cataloguers at Oseredok have often wondered whether the notes and lyrics represented some particular song or were purely decorative, arbitrary,or symbolic. It turns out that both the lyrics and the music are very real and correspond to a variant of an ancient hahilka/vesnianka (spring song and dance) called Kryvyi tanets’ or Crooked Dance. In this vesnianka a single line of girls moves rhythmically across a triangular area in a meandering pattern, much akin to the meandering pattern of the bezkonechnyk. Given that Tetiana Koshetz, an ethnographer in her own right, taught vesnianky to girls in Winnipeg on many occasions, one should not be surprised by a vesnianka written on her pysanka. In fact, this particular spring song could be traced to a manuscript written by Oleksander Koshetz (1874-1944), the renowned ethnomusicologist and, coincidentally, the husband of Tetiana. A search into the Oleksander Koshetz archive yielded a file labeled Vesnianky, 1921, file no. 43/20, in box 43 and inside, listed as No. 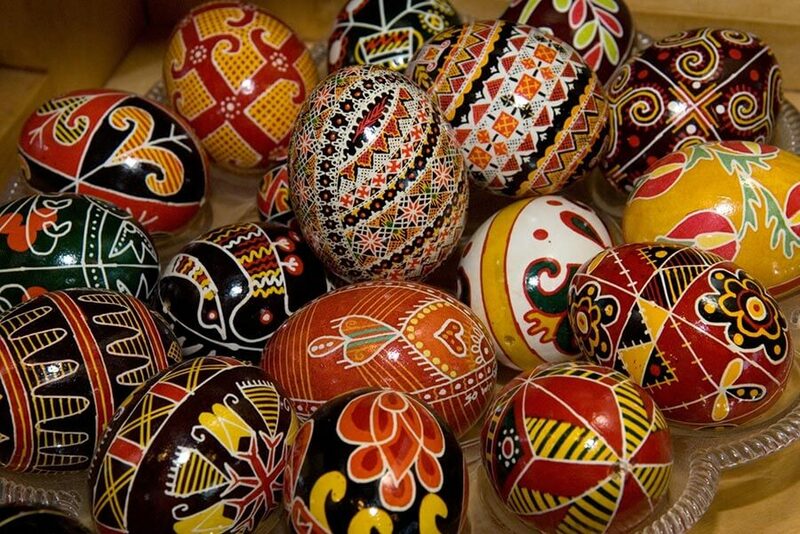 15, was Kryvyi tanets’ with the same words and melody as on the pysanka. We found the line in the manuscript that corresponds to the pysanka fragment in the photo and put the two together to tell you this story.